On Friday 31 October, the Coalition published guidance for government departments about its Family Test, which had been heralded back in August by the Prime Minister. 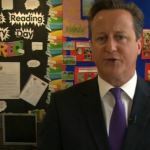 The PM had made his initial announcement standing in front of a Fatherhood Institute FRED (Fathers Reading Every Day) school notice-board – possibly a happy omen since this new policy may prove a game-changer for UK family services in relation to fathers. Back as far as anyone at the Fatherhood Institute can remember (and that’s quite a long time) ‘family’ in UK family policy has either meant or been interpreted by practitioners to mean ‘mother-and-child’ – and, occasionally, mother-and-child-and-maternal-relatives. ‘Family’ has been like the word ‘parent’ – regularly used synonymously with mother and, as in the Troubled Families programme, household-based. The definition of ‘household’ (and therefore ‘family’) has commonly been the benefits system definition: a household including a children and an adult (usually a woman) who holds the child benefit book. Engagement with men inside that household has generally been optional and poor, and engagement with fathers outside the household, non-existent. Services have never had to offer explanation for NOT engaging with fathers. They’ve been free to ignore them. Weirdly, even so-called ‘couple’ interventions have often been targeted at mothers alone, with the expectation that the women will go on to ‘save’ their couple relationship all by themselves. Ofsted’s Framework for Sure Start Children’s Centre inspection, published in April, offers a case in point. Essentially, it seeks to create dependence between the mother and the service, without developing wider family resources first, or at all. The word ‘couple’ does not appear in the Framework, and while the definition of ‘parent’ is said to include fathers, the text then describes fathers as a special-needs group (along with other minority groups like pregnant teenagers, children living with domestic abuse, children ‘in need’ or with a child protection plan etc.) who may be engaged with if the Centre itself deems this to be urgent in relation to the population it serves. Question 3: What impacts will the policy have on all family members’ ability to play a full role in family life, including with respect to parenting and other caring responsibilities? All family members have a role to play in family life, whether that is the role fathers play in raising children, that grandparents play in supporting parents, including lone parents, or that the adults play in caring for elderly relatives or disabled family While most people would recognise this aspect of family life, policy makers can sometimes fail to take a whole family perspective when thinking about the design and delivery of public services, sometimes underplaying or discounting the contribution of particular members, or failing to see the opportunities to support and enhance how families support each other. Question 4. How does the policy impact families before, during and after couple separation? , , , Post-separation the Government has a role to play in ensuring parents meet their responsibilities to their children and, where it is in the best interest of children, play a full role in their lives. . . Policy makers should . . . look beyond intact families or households when thinking about impacts. A key element in the Family Test is that policy makers are to document the potential impacts. These will be reviewed by the Department for Work and Pensions, who have generated and will monitor use of the Test. In addition, the existence of this policy is the more significant given the reluctance of the current Administration ever to make centralised policy. Coming hot on the heels of Nick Clegg’s announcement, that the Civil Service will pay fathers on parenting leave at the same level as mothers, the Family Test suggests a growing commitment to dismantle barriers in policy and practice that discourage and prevent fathers from playing a greater role in their children’s lives. Here at the Fatherhood Institute we will be doing all we can to hold the politicians and civil servants to that.